Coul Links, where the proposed golf course would be built. Councillors face a huge decision next week after their officials recommended refusing the controversial Coul Links golf course in east Sutherland. Proposals for the 18-hole championship course by Embo have drawn more than 1,600 objections, with conservationists arguing it will damage dune habitat and wildlife in a designated site of special scientific interest (SSSI). The plans are being spearheaded by US businessman Todd Warnock and renowned golf course developer Mike Keiser, who say the local environment can be enhanced. Yesterday, the chairman of local opposition group Not Coul, Tom Dargie, welcomed the council planner’s recommendation and described it as one of “the most unpopular applications” in the history of Highland Council. But Sutherland Independent Group councillor Jim McGillivray, who lives in Embo, fears his area could lose out on a “once in a century economic opportunity” in a village which, like many others in the north, have “endured generations of poverty, neglect and emigration”. The planner’s report, unveiled yesterday ahead of next Tuesday’s North Planning Committee, said the Coul proposals go against Highland-wide development plan policies on “sustainable design” and “natural, built and cultural heritage” by causing a “significantly detrimental impact” on the SSSI and an internationally protected wetland site. The official report, referencing Scottish Natural Heritage’s objection, says although mitigation has been proposed by the developers, the “residual losses are extensive and likely to be permanent” and that natural dune processes will be disrupted, fragmenting habitat. It also says that “translocation” of dune habitat is “unlikely to be successful” and not an appropriate technique to safeguard an area of such environmental complexity. But Ms Webster acknowledged that the application represents a “significant development proposal” for Sutherland and that there is clear support for the project locally. Dornoch Area Community Council say the 34 acres of SSSI directly affected would be better managed and that this, together with the economic benefits, outweighs the environmental concerns. The developers have repeatedly argued that creating another “world class” golf course close to Royal Dornoch would encourage golfers to stay longer in the east Sutherland area, generating more local jobs and significantly boosting the economy. Mr Warnock also thanked the local authority for their “professionalism and dilligence” and said he looks forward to next week’s meeting. But Mr Dargie said next week’s decision will “set a precedent” as to whether or not Scotland’s designated conservation areas are “for sale at any price,” and urged the developer to put forward an “environmentally responsible” course design instead of making councillors choose between jobs, which he argues would be low paid and seasonal, and a sensitive dune habitat. Scottish Wildlife Trust chief executive Jonny Hughes said the SNH objection demonstrates that the effect on the SSSI goes beyond the area that would be directly damaged, and that the true scale of the impact is still unknown. 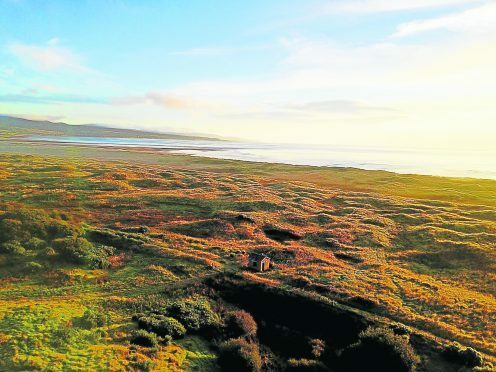 Mr Hughes stressed that coastal sand dunes are one of the world’s fastest disappearing habitats and that it would be “extraordinary” if councillors approved the development. RSPB Scotland also described the council planner’s recommendation as a “major blow” to the Coul Links plans, while Buglife Scotland and the National Trust for Scotland also welcomed the planner’s official report recommending refusal.